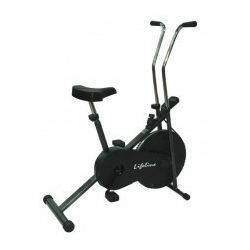 - Cooling fan wheel that cools the users while working out. - Electronic meter displays time, distance, calories burned, speed and scan. - Manual tension knob for strength adjustment. • Dimension : 64 (L) X 27 (W) X 48 (H). The commercial group bike (KH-820) combines a class method of weight loss and and aerobic exercise with the finest in modern technology with high power magnet and flywheel to get sufficient tension. Auto scan advanced computer with blue BACK-LT LCD screen & display Pulse, Recovery, Time, RPM/Speed Distance, K joule or Calories, Watt/Target Heart Rate, Heart Rate, Fat%, BMI, BMR, Body Type. We can offer a huge gamut of Recumbent Bike to our clients. These Recumbent Bikes are used to remove excess fat from the body and help in improving the metabolism of the body. Our offered Recumbent Bike is in high demand due to its salient features such as user-friendly functions, less power consumptions and sturdy structure.